Close-up view of live individuals of the new species crawling on a leaf. Discoveries of biodiversity at the Lilliputian scale are more tedious than it is for larger animals like elephants, for example. Furthermore, an analysis producing a DNA barcode – a taxonomic method using a short snippet of an organism’s DNA – is not enough to adequately identify it to the species level. 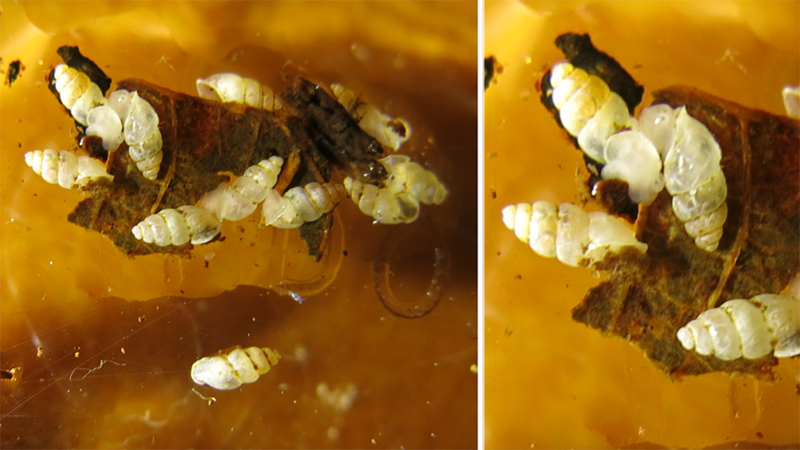 In the case of tiny thorn snails – appearing as minute white flecks grazing in moist, decomposing leaf litter – it is the shell that provides additional and reliable information needed to verify or question molecular assessment of these otherwise, nondescript critters. Broadleaf forest litter with white arrows indicating the newly described species on the leaves. However, at 2 mm, thorn snails are too small and fragile to handle and the few, if any, tangible details on the outside of the shells can only be seen using a high-powered microscope and computed tomographic (CT) images. This is exactly how the interdisciplinary team of Dr Adrienne Jochum, Naturhistorisches Museum der Burgergemeinde Bern (NMBE) and University of Bern, Dr. Bernhard Ruthensteiner, Zoologische Staatssammlung Muenchen, Germany, Dr. Marian Kampschulte, University Hospital of Giessen and Marburg, Gunhild Martels, Justus-Liebig University Giessen, Jeannette Kneubühler, NMBE and University of Bern, and Dr. Adrien Favre, Senckenberg Research Institute and Natural History Museum Frankfurt, managed to clarify the identity of a new Panamanian species. Their study is published in the open-access journal ZooKeys. Even though the molecular analysis flagged what it was later to be named as the new to science species, Carychium panamaense, the examination left no shell for the description of the new snail to be completed, let alone to serve as tangible, voucher material in a museum collection available to future researchers. The mini forest compost-grazer had to wait for another five years and Dr. A. Favre, who collected fresh material while traveling in Panama. The new snail is currently the second member of the family Carychiidae to be discovered in Panama. The first Panamanian, and southern-most member of its kind in the Western Hemisphere, is C. zarzaae, which was also described by Dr. A. Jochum and her team along with two sister species from North and Central America. The study was published in ZooKeys last year. Much like X-rays showing the degree of damage in a broken bone, CT images visualise the degree of sinuosity of the potato chip-like wedge (lamella) along the spindle-like mast (columella) inside the thorn snail’s shell. These structures provide stability and surface area on which the snail exerts muscular traction while manoeuvring the unwieldy and pointed, signature thorn-like shell into tight nooks and crannies. The alignment and degree of waviness of the lamella on the columella is also used by malacologists (mollusc specialists) to differentiate the species. These are computed tomographic (CT) images of the new thorn snail species. Normally, a study of a thorn snail’s shell would require drilling out minute ‘windows’ in the shell by using a fine needle under a high microscope magnification. The authors are hopeful that C. panamaense and C. zarzaae, which both inhabit the La Amistad International Park, Chiriquí, will remain a conservation priority along with other animalian treasures including the Resplendent Quetzal, Three-Wattled Bellbird and the Crested Eagles. The park is considered the 1st bi-national biosphere reserve, as it occupies land in both Costa Rica and Panama, and constitutes a UNESCO World Heritage Site since 1990.